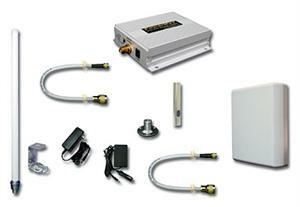 Get more bars with Digital Antenna's PowerMax 4KSBR-50M marine and RV wireless cell booster from wpsantennas.com. Designed for large boats with cabins, sailboats and RVs, this new and more powerful 70dB gain wireless cellular repeater systems boosts the signal strength of your cell phone or air card and increases the signal to the tower to up to 3 watts improving transmit and receive signals. The result is clean and clear voice quality with maximum data throughput on all carriers except Nextel/iDEN and and 1700MHz AWS (T-Mobile US 3G). Allows you to use your cellular phone up to 30+ miles from cellular tower. Wirelessly enhance multiple cell phones in multiple rooms within 18' to 40' from the system's interior antenna. PLEASE NOTE: Increased range varies based upon height of outside antenna, type of cable used, cell phone carrier, location of cell tower and obstructions between exterior antenna and cell tower. For maximum range, place outside antenna as high as possible using ultra low loss cable. Compatible with all US Cellular (800/850MHz) and PCS (1900MHz) carriers - not compatible with Nextel/iDEN or 1700MHz AWS (T-Mobile US 3G). Ideal for large yachts, sailboats and RVs. Requires 25' separation plus a structure between the inside and outside antennas - not for use in open console boats. Optional ratchet mount and ratchet rail mounts available. Compatible with all US carriers, cellular and PCS, except Nextel/iDEN and T-Mobile AWS 3G 1700-2100 MHz. The 4KSBR-50M is not designed for home use - the home version of the 4KSBR-50M is the DA4KSBR-50U. RETURN POLICY: Only new products in perfect condition are eligible for return. A 20% restocking/retesting fee applies. See our return policy for more information. 75' PowerMax Low Loss Cable that Connects Digital Antenna Amplifiers with Mini-UHF/Female to N/Male Connectors. 100' PowerMax Low Loss Cable that Connects Digital Antenna Amplifiers with Mini-UHF/Female to N/Male Connectors.